At KSB, we know how much your presence means to a loved one who is in the hospital. Here is a quick look at essential information that you, as a visitor, need to know. Visitors arriving after 8 pm should enter and exit through the KSB Emergency Department, located just off of First Street. To ensure the well-being of our patients, some units, such as our ICU, may limit visitation. Visitation for certain patients may be limited, based on their individual needs. Please check with the unit where your friend or loved one is a patient before visiting. KSB Hospital is a smoke-free campus for its patients, staff, and visitors. People with colds, sore throats or any contagious diseases should refrain from visiting KSB. At KSB, we pride ourselves on the quality and selection of items offered in our Cafeteria. Located on the Lower Level of the Hospital, our Cafeteria offers a variety of items for breakfast, lunch, and dinner. Vending machines and a microwave are located just outside of the Cafeteria Entrance. Complimentary coffee is always available in the cafeteria and on each floor. Lori’s Gifts, located on the first floor of KSB Hospital, offers a wonderful array of flowers, cards, jewelry, clothing and many more gift items. The gift shop accepts phone orders and all major credit cards and can be reached at (815) 285-5692. To place on online order, with free same-day delivery, please visit our Gift Shop page. 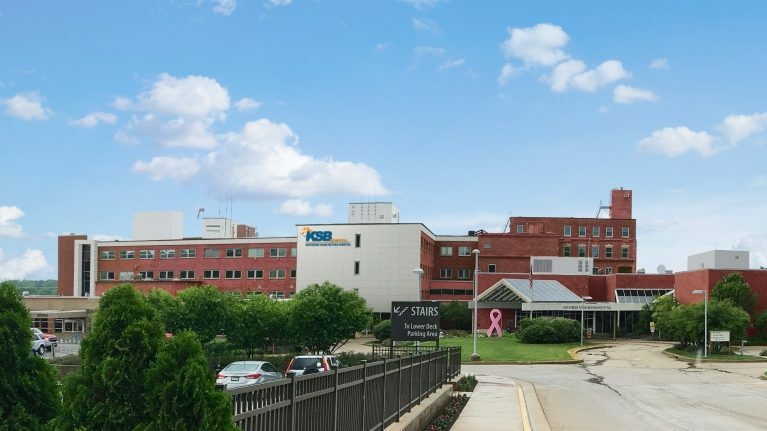 The Pastoral Care Department at KSB Hospital is dedicated to providing both patients and visitors with spiritual and emotional support during your time at KSB Hospital. Our goal is to deliver the very best and most complete spiritual care possible. Visitors are invited to use our Chapel for prayer and reflection. It is located across from the Gift Shop on the first floor of KSB Hospital. It is available 24 hours a day, seven days a week and is designed to be a quiet, reflective haven open to people of all faiths. Bible, spiritual literature, Rosary beads and prayer rugs are available for use while in the chapel and are located in the cabinets. If at any time you wish to speak with a KSB Chaplain while visiting KSB, please dial “0” and ask the operator to connect you with one of our Chaplains.